As mystifying as the Indian rope trick, this magic marvel defies the laws of gravity. PROBABLY Isaac Newton was right; but you couldn’t prove it with this gadget. It just seems to work contrary to all laws of gravity. Swami, by itself, reacts like any other object: supported at one end only—it falls. But, add a fairly heavy belt, as shown in the photo, and it will not only stay up but actually take quite a bit of extra pressure to make it tilt down, even slightly. We won’t tell you how or why it works. That is part of the mystery. Go ahead and make one and try to find out for yourself. You’ll be truly amazed. I figured it out. It’s quite logical captain. The secret is the belt. Why a belt? A belt is quite flexible in one way, but rigid in the other. The belt slides into the notch behind the “swami”‘s head, and thus the center of gravity is shifted back behind the fulcrum. looks like the hook part “clips” onto the belt. When gravity tries to pull the weight down, it pushes the belt sideways. The sideways pressure keeps the weight from going down any more and balances on the fingertip. This trick would not work with a piece of rope instead of the belt. I know I’m not explaining this well, but hopefully you get the idea. Indeed, ThnderCat, I believe we are of the same mind. I remember my dad made some of these – first out of some thin plywood scrap, then a few out of plexiglas that he gave as novelty gifts to my uncles. I don’t recall the second notch – they just looked somewhat like pipes (the smoking type) to me. I made one of these 25 years ago, in grade six shop class. It worked! I still have it somewhere. christopher: No. Torgo already answered it. Center of gravity is below your fingertip. Read this article from 1967. Look at the description of the pint sized monocyclist who defies gravity. 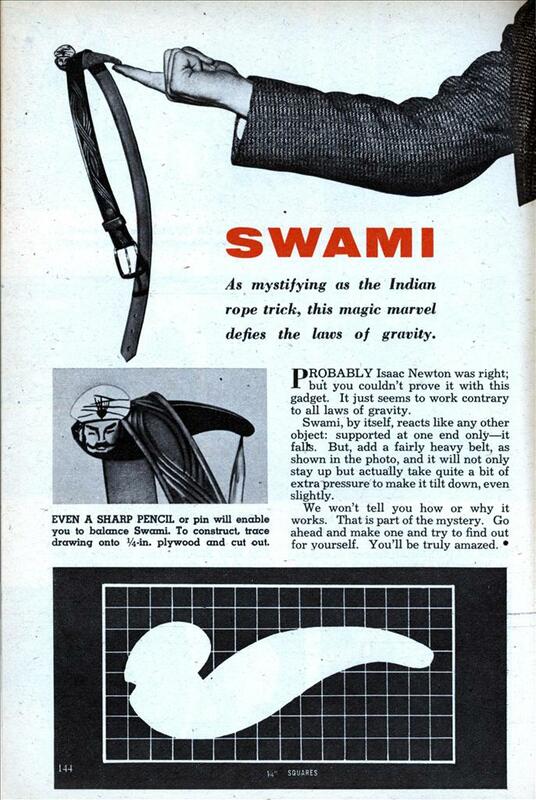 The swami isn’t “twisted into your finger” because the belt wants to be straight. Firebrand38, christopher is actually correct in what he says. The belt is stiff enough (as Torgo and ThunderCat pointed out) to want to stay in a plane by only bending easily in one direction. If the belt were hanging by a balljoint the thing wouldn’t work. The angled notch in the swami is critical to the function, because it twists the plane of the belt out of the vertical, and the offset center of gravity of the belt applies a moment (torque) to the swami. Your fingertip pushing up on the end of the swami applies an equal and opposite moment when the swami finds its correct rotated position, so both moments are balanced out. You are also correct in that the center of gravity of the belt-swami combination is directly under the fingertip. Both forces and moments are balanced. Randy: It’s obvious if the belt were replaced by a rope it wouldn’t work. But it’s simply because the center of gravity is below the balance point. It’s a question of balance and not “twisting”. If you look at the example in the link I provided you have a toy with two weights below the wire the cyclist rides on. There’s no “twisting” into the wire. The CG is below the wire so the toy doesn’t tip over. Indeed not, because in that case the wire(tightrope) corresponds to the fingertip in the Swami toy. The weights with crossbar correspond to the belt, and the cyclist corresponds to the Swami. The only reason the cyclist balances on the wire(tightrope) is that there is a rigid connection between the weight-holding crossbar and the cyclist. If there was a pivot there the toy wouldn’t work. It is an exactly analagous situation to the Swami. If one of the weights were heavier than the other, the cyclist would balance at an angle. But both toys depend on a connection between the swami/cyclist and belt/weightbar that transmits twisting/moment/torque. What I meant was rigid connection in the lateral direction–the wire can swivel fore-and-aft and not affect the operation of the toy. You keep stating the obvious with the need for a rigid connection. That’s irrelevant as to whether the tip of the Swami stays put because it twists into the finger tip. A single weight like the Swami directly below the center of the bicycle. It’s best described as the center of gravity is now below the bicycle keeping it upright and on the wire. The reason I insist on not characterizing it as twisting is that there is no corresponding lifting force at the swami’s “head”. Theoretically if the finger not there, the twisting force would twist down without the resistance of the finger tip. Replace the finger tip with a pivot at the pointy end and equilibrium will be maintained horizontally, the head won’t twist up as the pointy end supposedly twists down. 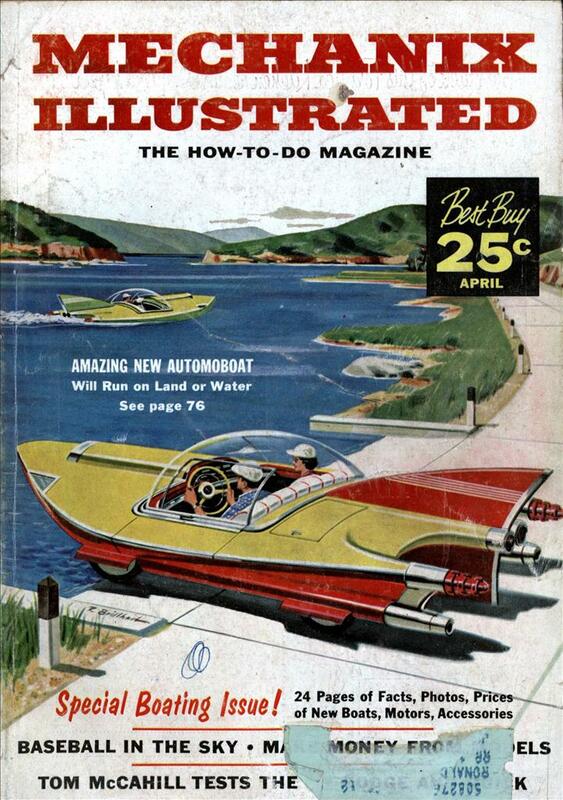 Firebrand38, if we could put pictures here I would draw a free-body diagram of the swami. Forget the finger and look at the pencil point supported picture. Take the pencil point as the fulcrum of the lever that is the Swami–the Swami is as much a lever as a see-saw is. But there is only one downward force on this lever–the weight of the belt. That weight times the distance between the belt slot and the fulcrum gives a counterclockwise torque to the lever. The Swami is like the left-hand side of the seesaw. But the seesaw has another weight to the right of the fulcrum applying a (hopefully equal!) clockwise torque about the fulcrum that balances the counterclockwise torque. In the Swami, what balances the counterclockwise torque about the fulcrum? The clockwise torque provided by the weight of the belt trying to hang in a vertical orientation, transmitted through the narrow slot. But since the belt is not glued to the Swami (in which case it would not be a very impressive toy) the interaction between the two pieces is where the interesting force and moment/torque balance happens. I could write you equations that relate the length of the Swami, the angle of the slot, and the length and weight of the belt that would give the angle of tilt of the Swami at equilibrium. Again, the “obvious” need for a rigid lateral connection between the counterweight and bicycle. You could not just hang the weight from a rope attached to the bicycle. @18: Firebrand, look at the hammer-lever example on the bottom of page 7. The rigid connection of the hammer to the right-hand side of the board applies a counterclockwise torque around the fulcrum, even though the hammer is attached to the board to the right of the fulcrum. You won’t win this one–I’m a mechanical engineer with 29 years of experience behind me. Randy: Not trying to win or lose anything. The swami stays up because the center of gravity is located below the balance point. Is that wrong? Center of gravity question. Could you make this work with torque alone? In other words what if the ends of the belt did not extend beyond the finger tip (towards the body) on which the device is resting? The picture I am looking at shows the ends of the belt closer to the body than the fingertip. So, although the connection between the belt and the swami appears to be away from the fingertip, the weight of the belt is actually closer to the body because the belt is stiff and angled toward the body. Would this work with what amounted to a much shorter belt…with just torque alone? Non-Engineer, it would work with torque alone, but the problem would be how to apply the torque. For every action there is an equal an opposite reaction, and that applies to torques too. In orbit, for instance, when the astronauts are using their power screwdriver they need to anchor themselves to the shuttle (or Hubble or ISS) or the reaction torque from using it will spin themselves in the opposite direction. The Swami would need some kind of motor (even rubber-band type) built in, and the support point would need to be a wheel (or portion of a wheel) that was pivoted or mounted in bearings in the body, that the motor was applying torque to. Think of a tiny dragster doing a wheelie on the fingertip. If you got the torque just right, the overhung weight of the Swami would just balance the torque being applied through the wheel. Since the swami would be balanced and not rotating, you would only need the small part of a wheel facing downwards (like a rocker support under the end of a bridge). No, forget what I just said. For that to work the pivot point would need to be attached to the fingertip, or the dragster-swami would just roll itself off the tip. Even in that case, it would be dynamically unstable and would need active torque control (if the torque rotated the Swami up even a little bit, the moment arm of the Swami’s weight would decrease and the torque would flip the Swami over if it weren’t reduced to still balance).